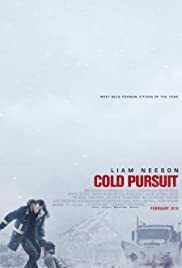 Director: Hans Petter MolandWriters: Frank Baldwin, Kim Fupz AakesonStars: Liam Neeson, Laura Dern, Micheál RichardsonSummary: Quiet family man and hard-working snowplow driver Nels is the lifeblood of a glitzy resort town in the Rocky Mountains because he is the one who keeps the winter roads clear. He and his wife live in a comfortable cabin away from the tourists. The town has just awarded him "Citizen of the Year." But Nels has to leave his quiet mountain life when his son is murdered by a powerful drug lord. As a man who has nothing to lose he is stoked by a drive for vengeance. This unlikely hero uses his hunting skills and transforms from an ordinary man into a skilled killer as he sets out to dismantle the cartel. Nels' actions ignite a turf war between a manically unpredictable gangster known as Viking and a rival gang boss. Justice is served in one final spectacular confrontation that will leave (almost) no one unscathed.